Set of 8 Model Air colors in 17 ml. for painting the aircraft of the RAF Coastal Command , for land based aircraft as well as for seaplanes, from 1939 until the end of the war. 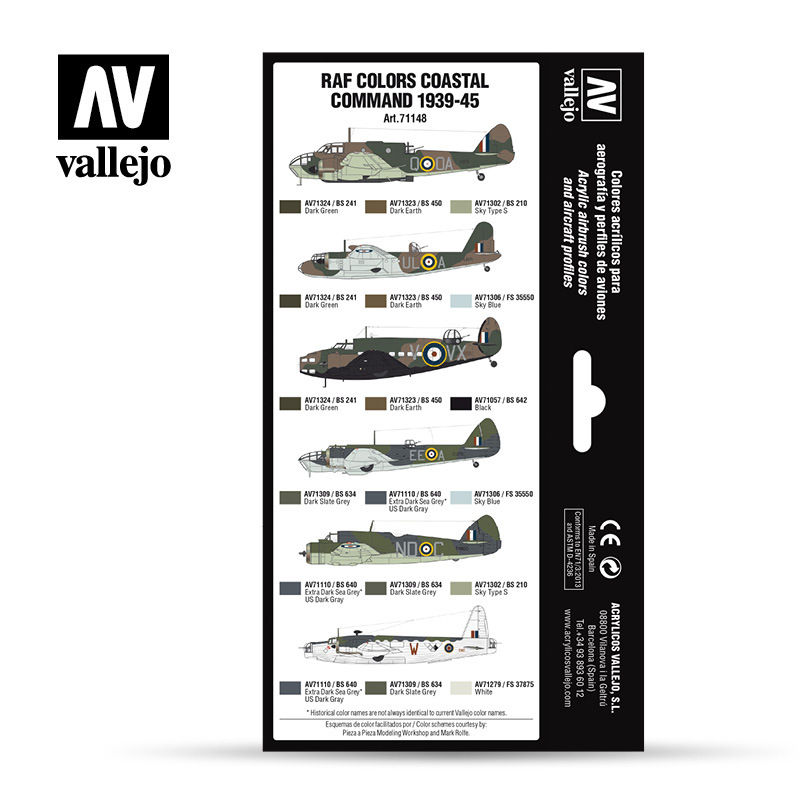 Dark Earth (BS 450): Color for upper surface, combined with Dark Green (Temperate Sea Scheme), from 1939 to 1941, used on land based aircraft, for all kinds of missions. Dark Green (BS 241): Color for upper surface of the plane, combined with Dark Green (Temperate Sea Scheme), from 1939 to 1941, used on land based aircraft, for all kinds of missions. Extra Dark Sea Grey (BS 640): Color for upper surface, combined with Dark Slate Grey (Temperate Sea Scheme) from July 1941 until the end of the war, or by itself (1944-45), for all types of aircraft and missions. 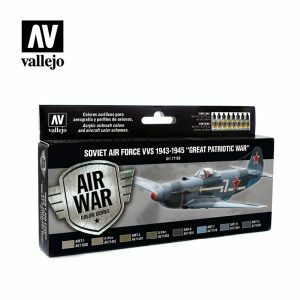 Dark Slate Grey (BS 634): Color for the upper surface, combined with Extra Dark Sea Grey (Temperate Sea Scheme), from July 1941 until the end of the war for all types of planes and missions. Sky Type S (BS 210): Color for lower surface, with Dark Earth/Dark Green o Extra Dark Sea Grey/Dark Slate Grey (Temperate Sea Scheme) on the upper part from 1939 until the end of the war. Also used for numbers, codes and fuselage stripes. Sky Blue (FS 35550): Color for lower surface, combined with Dark Earth/Dark Green or Extra Dark Sea Grey/Dark Slate Grey (Temperate Sea Scheme) on the upper part from 1939 to 1941. Night Black (BS 642): Color for lower surface combined with Dark Earth/Dark Green on the upper surface (Temperate Sea Scheme) or Extra Dark Sea Grey/Dark Slate Grey, from September 1940 to June 1941. White (FS 37875): Color for lower surface and sides combined with Extra Dark Sea Grey/Dark Slate Grey on the upper surface (Temperate Sea Scheme). From July 1941 until the end of the war.